I "acted" in two commercials this year. Both were for Sears. One appears online at Sears Wrestler on YouTube. The other ad was an inhouse promo for Sears. It is not available (at least not yet) for public viewing. The ad was intended to encourage Sears employees to wear elf hats. It was a cute ad which featured me as a technician guy. It was not stated, but I think I played the same character as in the other ad. Also appearing was Santa Claus. Santa was a jolly old soul (sorry) from the north (Wisconsin, not the North Pole). He has appeared in several other commercial, too. You've probably seen him without even knowing it. As you'd expect, Santa took kindly to this ad rookie. He gave me a few pointers and mostly helped me relax. He was very helpful and it really made the experience sop much better. Whether you believe in Santa or not, believe in the season. Believe in the spirit. 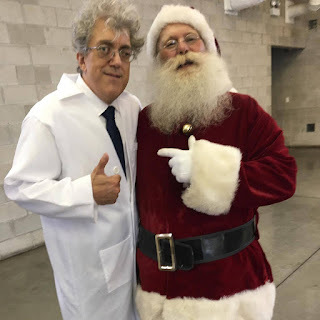 Santa and me in Chicago, IL-August 2016.